The maker of Reva, India's first electric car, Chetan Maini and Uday Khemka's SUN Mobility has joined hands with American tech giant Microsoft to build a smart network to effectively deploy its universal energy infrastructure. The maker of Reva, India's first electric car, Chetan Maini and Uday Khemka's SUN Mobility has joined hands with American tech giant Microsoft to build a smart network to effectively deploy its universal energy infrastructure. SUN Mobility will use Microsoft's technology to connect its batteries and quick interchange stations (QIS) with end users through a mobile application. The network would leverage Microsoft Azure IoT (Internet of things) for tracking, health monitoring, diagnostics and anti-theft capabilities of the batteries. The geospatial visualization and planning tools help with the deployment of a city-wide network of stations at strategic locations for efficient battery swapping service delivery. SUN Mobility also plans to utilize Microsoft Azure AI in the Smart Network to analyze telemetry data to build Machine Learning (ML) models that would predict battery performance, energy requirements and improve service delivery experience for EV users. "In an era where the future of mobility is electric, powered by renewable energy and driven by AI, we're excited to partner with Microsoft, to leverage cutting edge Cloud, IoT and AI technology," said Uday Khemka, Co-Founder and Vice Chairman of SUN Mobility. Sun Mobility's platform works across various two and three-wheeler vehicles and comprises of modular smart batteries that are intelligent enough to customize themselves to each vehicle type and versatile enough to be used in combinations of one or multiple batteries. Its quick interchange stations that can be easily installed across a city, enabling swapping of batteries in less than one minute while the smart network connects these batteries and and interchange stations allowing customers to locate stations and make payments via an app. "This partnership is testimony to our commitment towards empowering people and organizations to achieve more through innovative implementation of Microsoft's intelligent edge and intelligent cloud platform," said Chad Fowler, GM and CTO, Startup and Developer advocacy, Microsoft. "After having worked with SUN Mobility as part of the ScaleUp program, we are excited about the immense potential that the organization will be able to drive using Microsoft's Azure based solutions in the sustainable energy industry. Together we will enable both efficient and safe transportation for our planet." "With over 18 million two wheelers and three wheelers sold in the country last year, we have introduced the world's first interoperable solutions for electric two and three wheelers that will transform the way people commute." 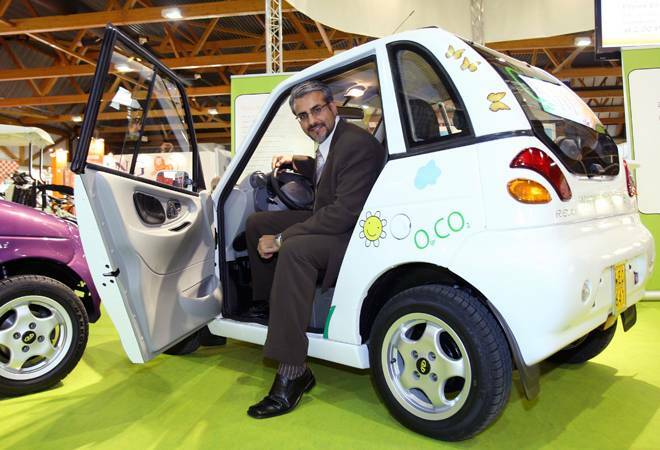 said Chetan Maini, Co-Founder and Vice Chairman of SUN Mobility. "SUN Mobility is enabling the electric mobility ecosystem in the country by offering solutions that are convenient, cost-effective and scalable." Maini claims his platform would enable electric two and three wheelers to be cost neutral versus conventional diesel/petrol ones. While electric vehicles offer much lower cost of running and maintenance over conventional fossil fuel powered vehicles, they are still significantly more expensive due to higher cost of lithium ion batteries. Further, lack of charging infrastructure is one of the main reasons for the handicapped growth in the segment.In 2016-17, just 22,000 EVs were sold in India, the majority of them two and three wheelers. The Indian government has been pushing for electrification of the transport industry in the country not only to bring down the oil import bill--India imports 80 per cent of its crude oil requirement every year, but also to improve the quality of air in the cities. As per a WHO report, India accounts for half of the 20 worst polluted cities in the world. A Niti Ayog and Colorado based Rocky Mountain Institute report on electric vehicles released last year talked about a reduction of 156 million tonne of oil equivalent (mtoe) worth Rs 3.9 lakh crore if its target of electric vehicles accounting for 40 per cent of two wheelers, cars and SUVs and 100 per cent of all commercial vehicles and three wheelers is achieved. It had also suggested swapping batteries as an alternative to charging, a concept that has been tried with a degree of success with buses in China, the world's largest EV market. It has also been successful with two wheelers that use smaller and lighter batteries. SUN Mobility is hoping to replicate these successes in India. It says it will offer its platform in collaboration with multiple OEMs and solution providers and will support a range of new models as well as retro-fit applications. The company plans to roll out this network of quick interchange stations in a phased manner across various major cities, thus enabling customers to adopt electric mobility using an innovative pay-per-use model that reduces not only their initial cost of purchase but also overall operating cost.